Caring for chickens in cold weather requires a little planning and a few special considerations in order to keep your flock happy and healthy throughout a blustery New England winter. Chickens are naturally very hardy and their thick layers of insulating feathers help them to withstand winter's cold temperatures. However, chickens are susceptible to chilling winds and icy rain, and they require suitable shelter and protection from the elements. Keeping a small backyard flock of chickens is a fun and rewarding hobby, and a happy flock of hens provides a ready supply of fresh eggs. However, caring for chickens in winter during the long, cold months requires proper housing for protection against the weather and additional attention to feed and drinking water to maintain a healthy flock. 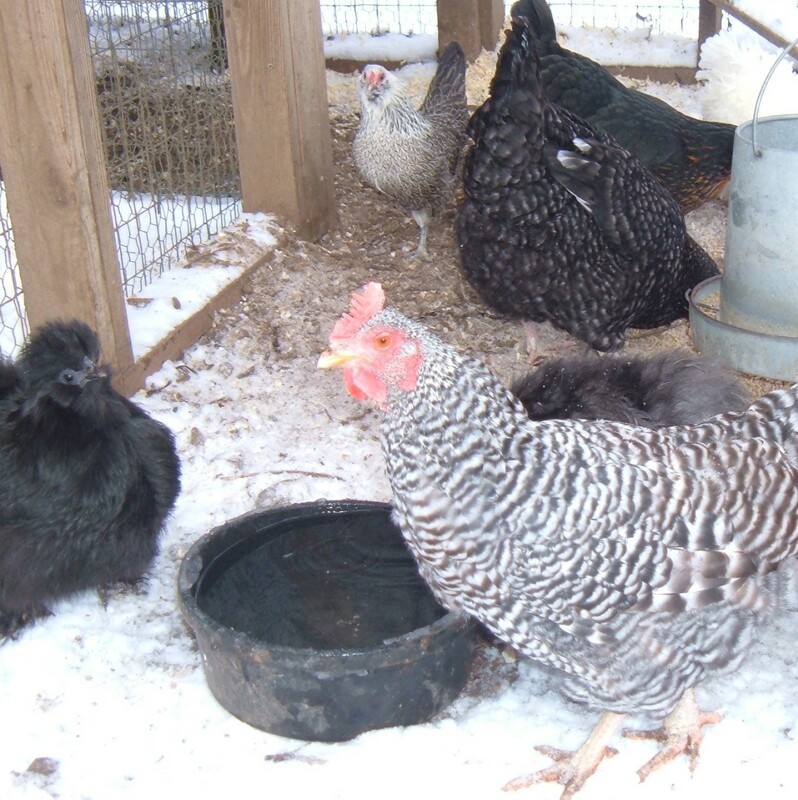 Here are a few tips on caring for chickens in cold weather. With their feathered insulation, chickens are well suited for cold temperatures. Our urban chicken coop includes a small hen house with a fully protected run that allows them to wander outside wherever they want. Except for very windiest of days or during storms, the chickens spend most of their time scratching around in the outdoor run. They often roost at night on one of the outdoor perches, positioned high in the run and in an area that is usually blocked from the wind. It is quite comical to see them lined up, wing-to-wing and snuggled in for the night, even on a cold winter night in New England. Chickens are very tolerant of cold temperatures, but they are very susceptible to drafts. Position the chicken coop out of the prevailing winds, and insulate the interior of the chicken coop to reduce chilling drafts. Our coop is insulated to help block drafts, but it is not heated. When the chickens do decide to come inside and use the coop to roost, their body heat is trapped by the insulation and helps to raise the temperature within the hen house. Adding a thick layer of pine shavings or straw to the floor of the chicken coop will protect the chickens further from the cold. We purchase bales of shavings from the local feed and grain store for less than $8.00 per bale, and spread a thick layer of shavings over the floor and into the nesting boxes. Then, the chickens rearrange the shavings to their liking. The shavings are easy to clean, and it takes only a few minutes to shovel out the hen house and replace with a fresh layer of shavings; the old shavings go right into the compost heap. 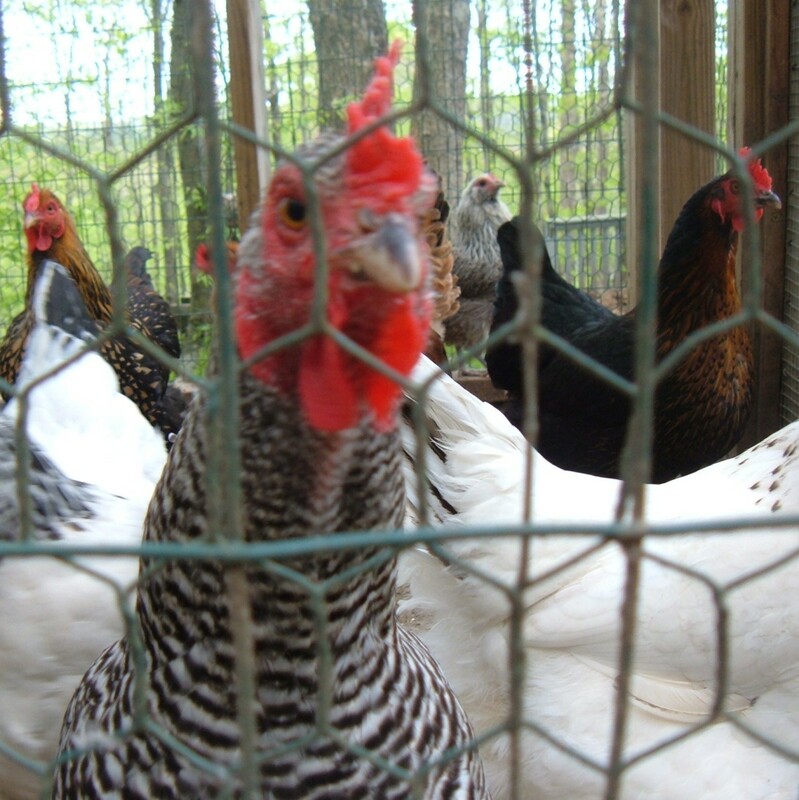 The run is a fenced and secure outdoor enclosure attached to the chicken coop, and provides the chickens with access to the outdoors while protecting them from predators such as hawks, foxes and dogs. Our runs are fully enclosed on all sides by two layers of plastic-coated wire, including over the top and buried under the bottom of the run. 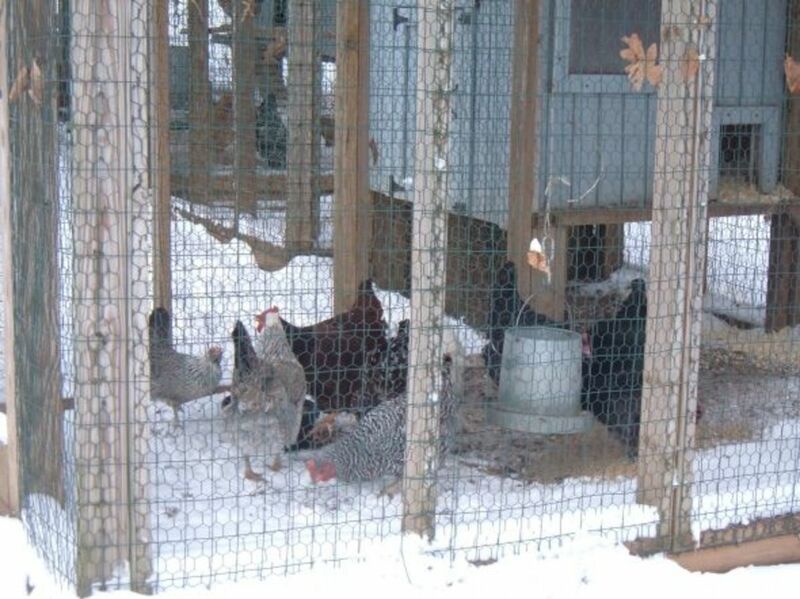 Even during the coldest weather, chickens enjoy being outdoors to scratch in the dirt. Protect the flock from snow and rain by covering the top outdoor run with corrugated plastic sheathing, which is inexpensive, transparent and available at home centers. If the run is very large, cover a section near the entrance to the hen house. Use a tarp or plastic sheeting to cover the sides of the run, providing the chickens with additional protection from the wind and wind-driven snow and rain. During the coldest months of our New England winter, we wrap the northeast corner of the run with a large canvas tarp. Be sure to fasten the tarp securely. If the tarp flaps in the wind, the flapping motion seems to spook the chickens. The tarp we use has metal grommets inserted along the edges, and this makes it easy to hang the tarp from a few well-positioned screws. We then use plastic zip ties to firmly secure the tarp and prevent it from flapping in the wind. Do not fully enclose the run, which reduces ventilation. 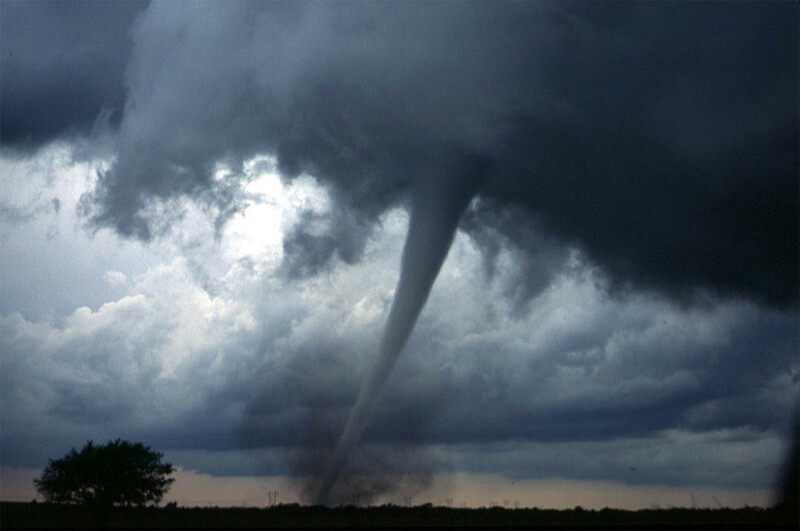 Instead, use the tarp or plastic sheeting on one or two sides of the run to help block the prevailing winds. Attach a couple of perches, as high as possible in the run, for chickens to roost and see the world around them. 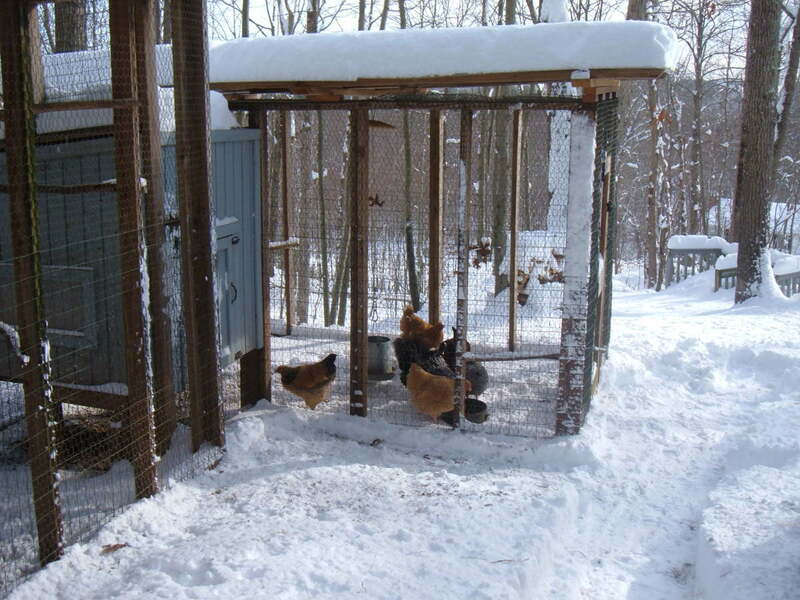 Your chickens may even use the perches to roost at night during all but the coldest weather. Chickens burn extra calories in the winter as they warm themselves against the cold weather, and they tend to eat more prepared feed to fuel their bodies and produce internal heat. This is especially true for chickens who free range in the backyard and burn extra calories as they move about in search of anything edible. 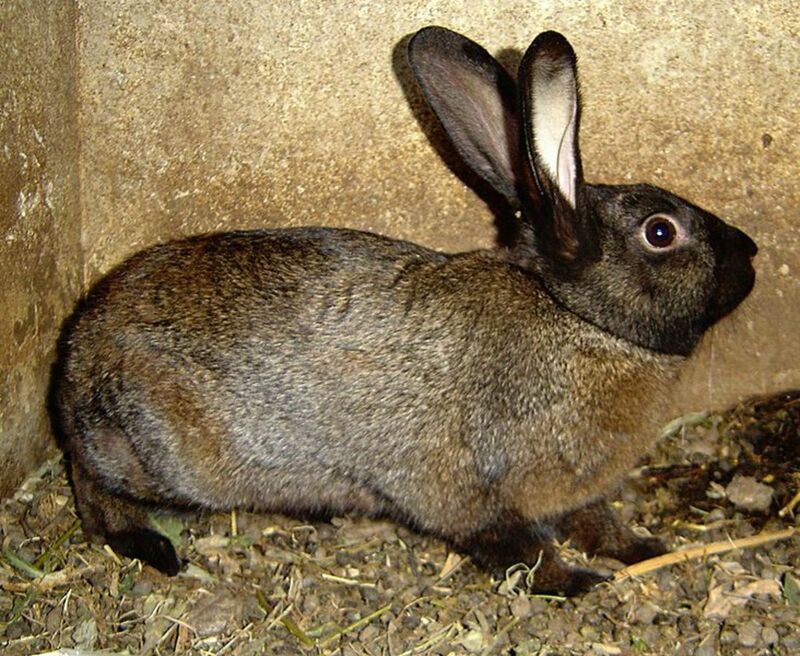 During warm weather, they feed on seeds and bugs as they pick through the grasses and garden mulch. In winter, the chickens need rely on the feed bin so keep it full. Scatter grain or a cracked corn treat around the run to give the chicken a little extra scratching and pecking activity. 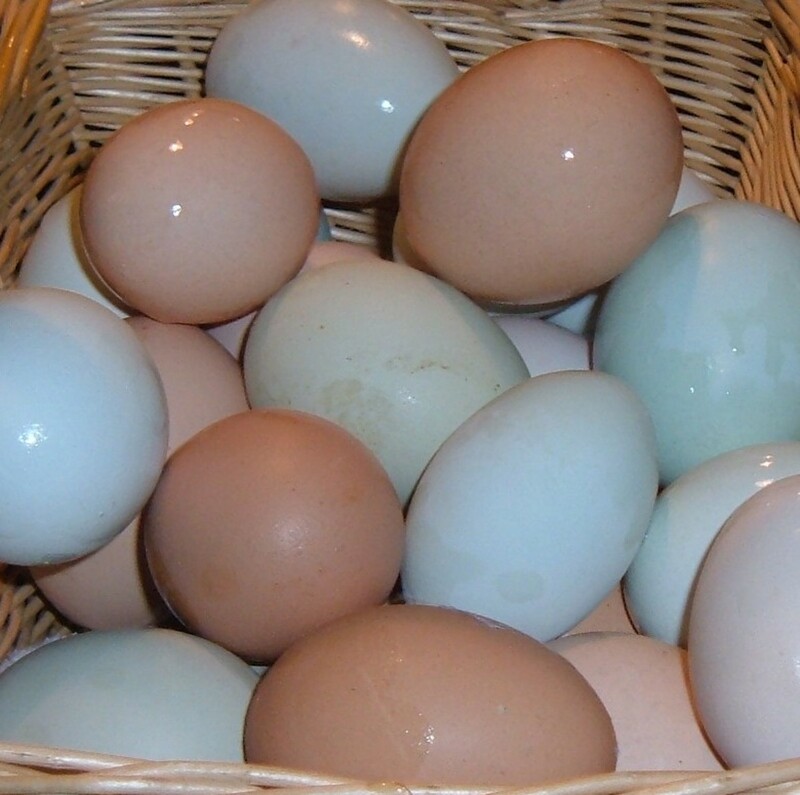 Fresh eggs are one of the key benefits to keeping a small backyard flock of chickens. But when the temperature drops, eggs left in the chicken coop will freeze quickly, cracking the shells and spoiling the eggs. Each time the water dish is checked and cleared of ice, check the nest box for fresh eggs. 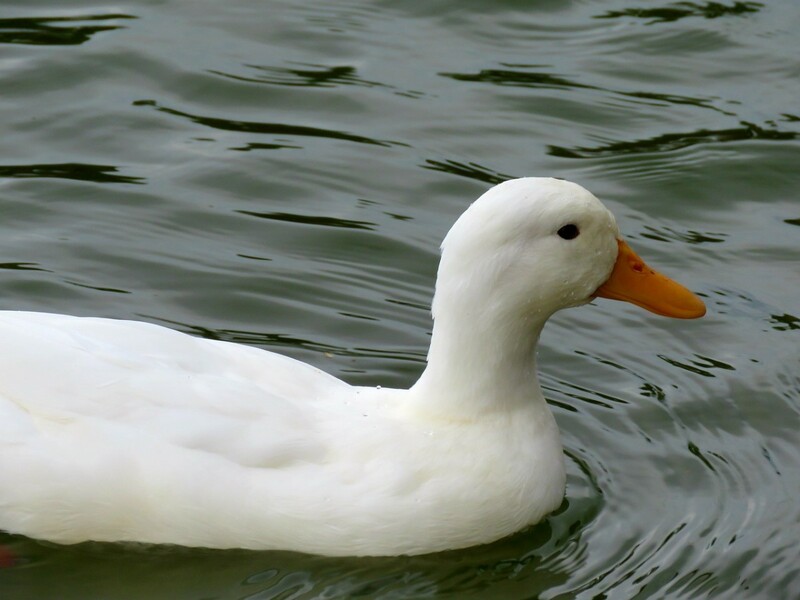 Egg production usually decreases as the temperature drops and the days get shorter, but the number of eggs will pick up again as Spring approaches and the days begin to get longer again. Some backyard chicken farmers install lights in their coops to increase the hours of light for the chickens, hoping to increase egg production during winter's shorter days. Our urban chicken coop and hen house is not lit and though egg production drops off in the winter, our hens still supply us with enough eggs for our use. And we often have extras to give away! Don't Let the Water Freeze! Drinking water freezes quickly in cold weather. Electric Water Heaters are safe, energy-efficient and keep the water from turning to ice. Chickens need clean, fresh water every day. When the temperature drops below the freezing point, the chicken's water bowls quickly become tiny frozen ponds. In very cold weather, it may be necessary to check the water bowls twice each day, first in the morning and then again in the early afternoon. Rubber feed bowls offer an easy, low tech approach to dealing with the ice. These bowls are flexible, making it easy to remove the ice whenever the water bowl freezes. After a cold night, the water bowl may be covered in ice or even frozen solid. A strong tap on the frozen ground or against a tree or rock is enough to break away the ice, and the rubber feed bowl is ready for a refill of clean water. Specially designed water heaters for poultry and livestock are inexpensive and work well, but require electricity and maintenance. After using the rubber bowls for several winters and breaking away lots of ice, we decided to run an electrical circuit out to the chicken coop and purchase a couple of heated water bowls. The consistent supply of drinking water was worth the bit of effort and cost. The bowls stay free from ice all winter, and we never have to worry about our animals going thirsty. Yes, and you can't beat the fresh eggs! Cute Baby Chicks Grow Up to Become Chickens! Since moving to "the country," we always wanted to have a small flock of backyard chickens. One of our friendly neighbors has a small flock, and she showed her chicken coop and run. We then purchased several chicken care books (highly recommended) and researched more information online. We started our little flock with six little fluffy chicks as a surprise for our kids on Easter morning. Snuggled together in the corner of their indoor pen, it was hard to picture that these cute, adorable little guys (well, actually gals) would quickly grow up to become awkward teenage polts before blooming into beautifully plumaged and full grown hens. But we enjoyed every stage of their growth, and we add more chicks each year to our growing flock of backyard chickens. As the flock continues to grow, we had to expand the chicken coop and increase the size of the protected run! Definitely chilly weather now. I can imagine that it looks gorgeous in the country where you live. Our back yard is beautiful with the snow draped on the trees. Have a wonderful week. Thank you for sharing this lens. We actually have two chickens, one rooster and a hen. Luckily we live in the tropics so the cold is not as big of an issue, but the information you have shared is definitely helpful for anyone who takes care of chickens. You clearly care for your chickens very well. 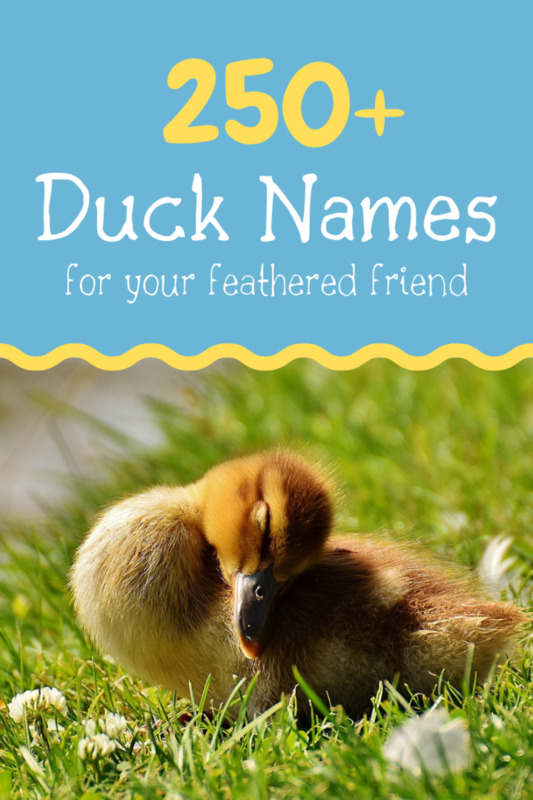 Great items to help the backyard chickeneer. A lot of this advice can apply to caring for other animals besides chickens. I think I saw your chickens actually smiling because they are so well cared for in cold weather! I have been using a heater for the water as you suggest. Your chickens are beautiful. My new flock just started laying and haven't stopped yet, even tho' it's so cold--I expect that'll change in the next few weeks. Water freezing is definitely an issue where I live. Chickens can break through a thin layer of ice with their beaks, but when it gets too thick we have a problem. Our hens are free and happy:) Yours don't look bad, either! My grandfather also always had chickens growing up, thanks for the memories... and I live in MT, where it is easy to raise your own chickens, but love your ideas about the cold! My grandfather used to have lots of chickens when I was growing up and I remember how much he loved them and cared for them. Thank you for the information on the wind break. I never would have thought about that before! Even though I do not have chickens, I found this fascinating. 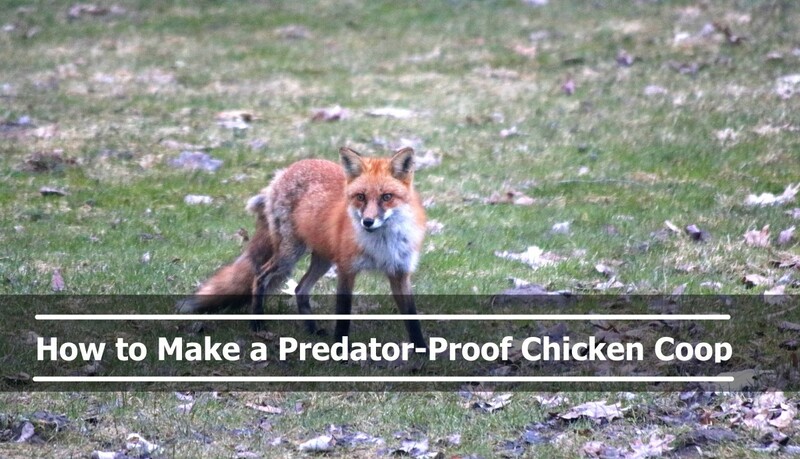 So much of the advice would be applicable to a lot of outdoor animals. Most excellent! Nice lens and great tips! I like your video showing the chickens in the snow. I've had a lot of people wonder "well what do you do with the chickens in winter?". People don't realize with a little planning and preparation, chickens can do just fine in the winter. I love all your original chicken pictures and it is indeed that time of year to insure that your chickens will be warm over the cold winter months. Best of wishes for a wonderful holiday season. With the cold it is not far to follow. Our neighbors have chickens, I would have them except I have a border collie. I thought the Chinatown news link was hilarious - about the tic-tac-toe chickens. This is really cool. A neighbor of ours has chickens in the city, and sometimes they get out of the pen. it is so cute to watch them wander around the yard pecking for food. Loved the pictures of your chickens busily pecking in both summer and winter. You sure create some great wood projects, your coops are gorgeous, and that really does take some skill. This article was very helpful. I have a friend that has recently got a small flock of chickens, so I will share this great information with him! I love chickens. Your chickens sound like they are the happiest ones to be found with all the care you take for their special needs for cold weather comfort. I've always wondered how people get the eggs without being flogged by the chickens. That's one big reason why I haven't took the leap and got some (bad flogging experience as a kid). winter is great in florida. Other than turning on the heat lamp a few nights a year, chickens do great here! Thanks for a great article! Our chickens won't go out if there's snow, and we have a tarp over their run. Funny chickens! We have 8 chickens right now, but one of them is sitting on 8 eggs so we should have more soon. We live in the country so we're able to just let them run free. 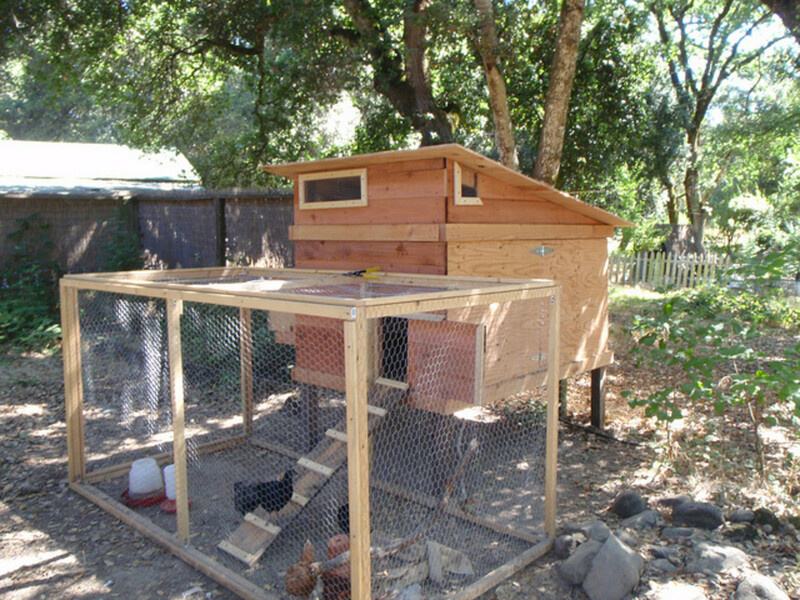 When we built their coop, we had the hot summer temperatures in mind. So the entire thing was pretty much just wire. When that first cold snap came, we were in a frenzy to insulate! lol. They seem to be doing okay though. I'm glad I read this lens. Mine have been eating more and I never knew it was because of the cold. Thanks! Great info! We're thinking about getting chickens again this year, and all the information in this is exactly how we had to care for them. We also put up plastic sheeting on two of the coop walls as wind blocks, and put a heating lamp on the ceiling. This lens makes me miss our chickies, I can't wait to have more! 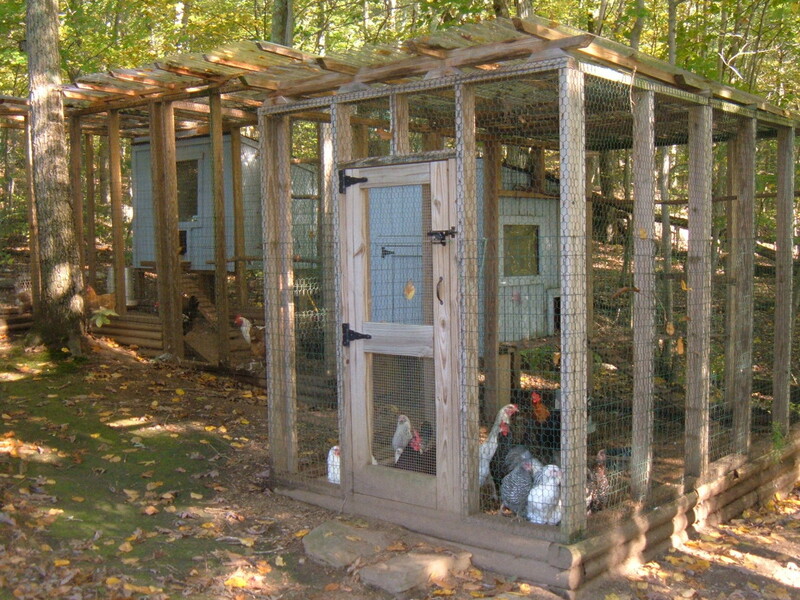 What a great idea...to have your own chicken coop. I watched "Food Inc." the other day and was shocked at how the "non-organic" chickens are being raised - so much cruelty to keep chickens in the dark buildings for their entire life, letting them stand in their feces, and there are so many of them, they can't even take a step... It just makes me want to get a couple chickens of my own, although I do have a feeling I would treat them as pets and would only eat their eggs... My mother-in-law keeps around 100 free-range chickens, and it is so neat how they like to hang out on tree branches. Wow... I have always wanted to raise my own chickens.. and this is GREAT!!! Thanks! Blessed! This is an excellent lens, very good solid tips for winter chicken care. As you can see from my avatar I do that same as you on Ontario. Blessed. I used a ceramic heat emitter bulb for my chickens when I was living where it snowed. It worked very well. I appreciate the lens, reminds me of the days way back yonder when we ordered our chicks from Montgomery Ward. Nice job. They'd be warm in a cooking pot! ha! Just kidding. Nicely done lens! Squid Angel blessed! We had a chicken as a backyard pet. She ate the bad bugs out of our garden, shared feeding time with a squirrel and gave us the best brown eggs. She was with us for over 5 years. Enjoyed your lens. I have a flock of a dozen chickens here in Maine, and they survive winter far better than I ever could have imagined. They do appreciate some hand outs from the kitchen this time of year! Left over oatmeal, salad greens, pasta or just about anything else I bring to them. And they turn all those leftovers into delicious eggs. Winter, spring, summer or fall, my family knows they can often find me sitting on a log in the hen yard, just watching the biddies do their thing! Nice job on your lens! Chickens are so much fun! Glad to see there is another chicken-lover here besides me! A lot of good information here, as well as reference books. @sockii: Good points, and thank you for visiting! 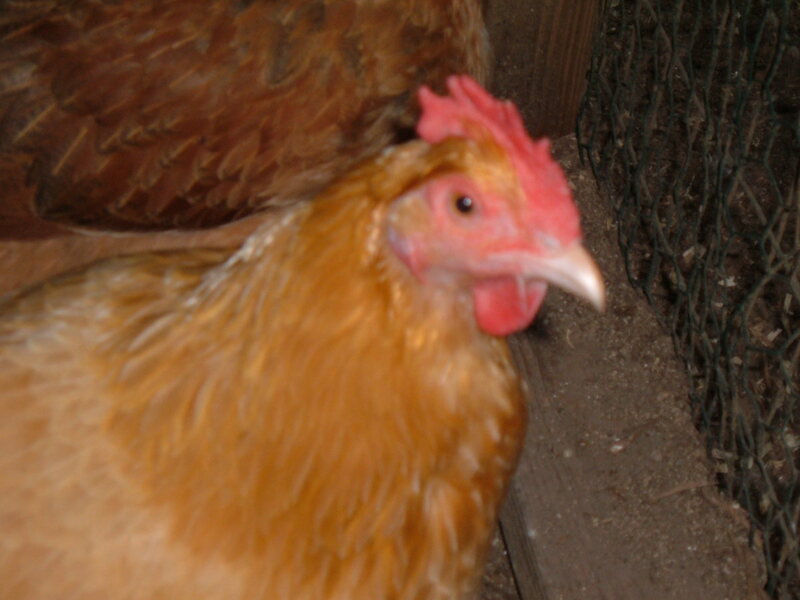 We do not have any roosters, but even the combs on hens can suffer in from severe cold. 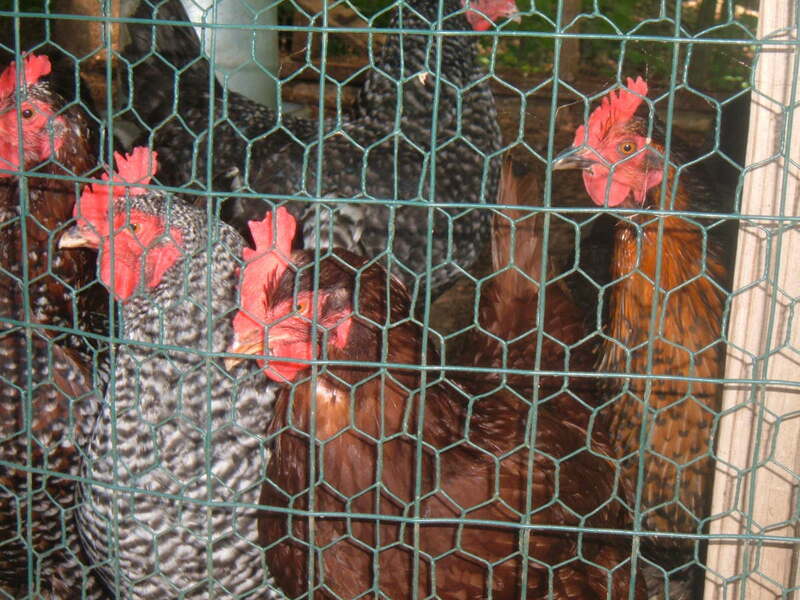 We have about 15 different varieties of chickens and so far, all have done well through several New England winters. Excellent lens on an important subject! I will note that if you have roosters that in really cold weather it's important to check on their combs for frostbite, and some varieties of chickens are better suited for the cold climates than others. Congratulations on front page honors for keeping your chickens warm and caring for them in cold weather! I have a flock of backyard chickens. They seem to enjoy the cold weather and want to free range regardless of rain or snow. Sometimes they will go into a shelter, but they do not seem to mind precipitation of any kind. Their first encounter with snow was pretty humorous as they tried to figure out what it was. I love my chickens! We raised turkeys last year in our suburban garage for a 4H project. They're much more susceptible to heat and cold. This year, we're thinking chickens! Thanks for a very informative lens. I really appreciate this very practical information about caring for chickens. It gets pretty cold here, so I need to ensure that I have all of the bases covered before hatching my first chicks. Thanks for the resources. 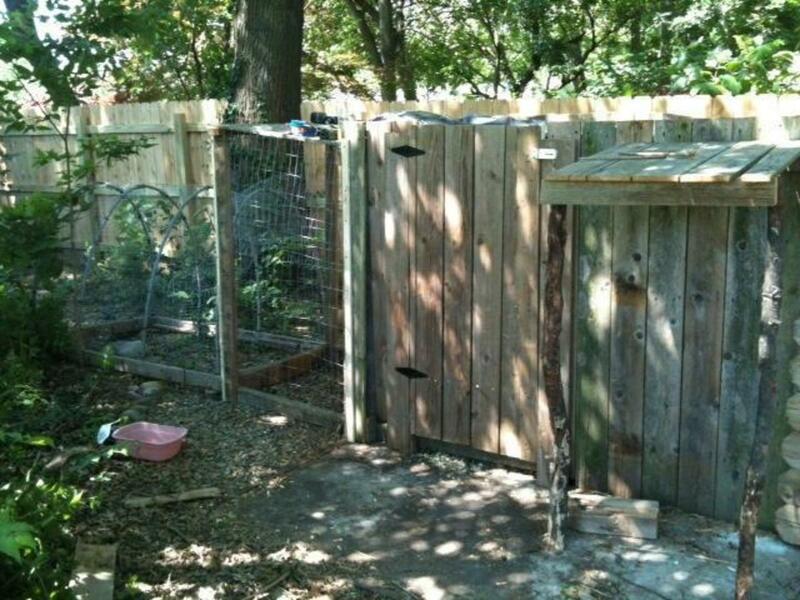 I plan to build my own chicken coop. I try to have chickens as much as possible. Right now we are moving so I have no flock. I sure miss the eggs. Much more nutrition and flavor! My grandmother used to raise chickens in a fenced in coop outdoors. Would you recommend putting a space heater when taking them indoors to keep them warm? I grew up on a farm, and we always had chickens there. They are very entertaining ladies, and those fresh eggs can't be beat. Enjoyed reading your lens! Great lens! And by the way, chicken is my favorite dish...and there was never a time that i ate breakfast without fried eggs! LOL! Sure, chicks need good care and warmth in winter too. I love chickens and fresh eggs and do plan to put some on my property. This lens is and will be a big help...thanks for the great information! Always such practical advice from you. I love your idea for checking for eggs each time you check and clear the water of ice. You must have the happiest chickens ever! @OhMe: Hi OhMe,Thank you for visiting! Chickens can overheat in hot weather. Our coop has an overhang to create a protected area underneath, and is located under several large trees. The coop is also shaded by a shed built in front of the coop (the shed also blocks the prevailing winter winds). Always make sure the chickens have clean, fresh water and shady areas to get out of the hot sun. @evelynsaenz1: Hi Evelyn,Thank you for visiting! Chickens need room to move around, and crowding the birds can cause the dominate hens to pick on their smaller and weaker room mates. 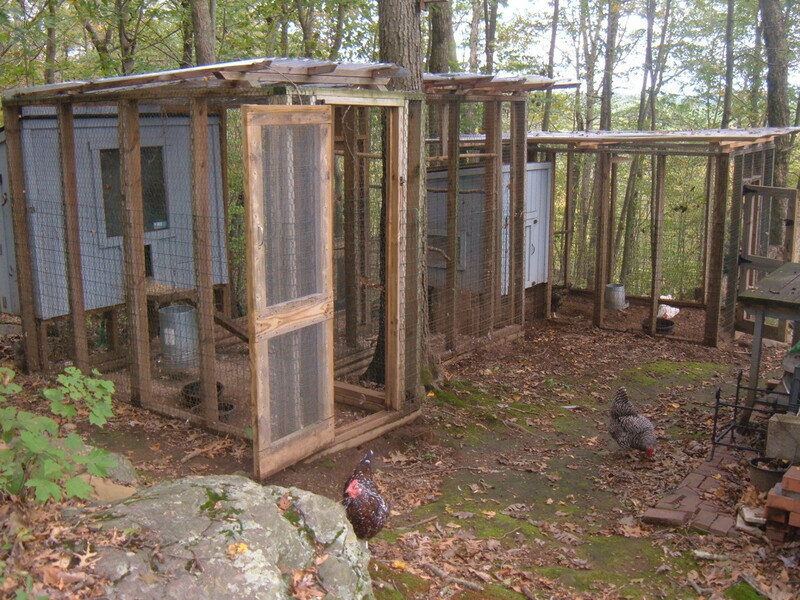 Our combination of coop plus outdoor is over 200 square feet -- plenty of room for our small flock of 15 hens. 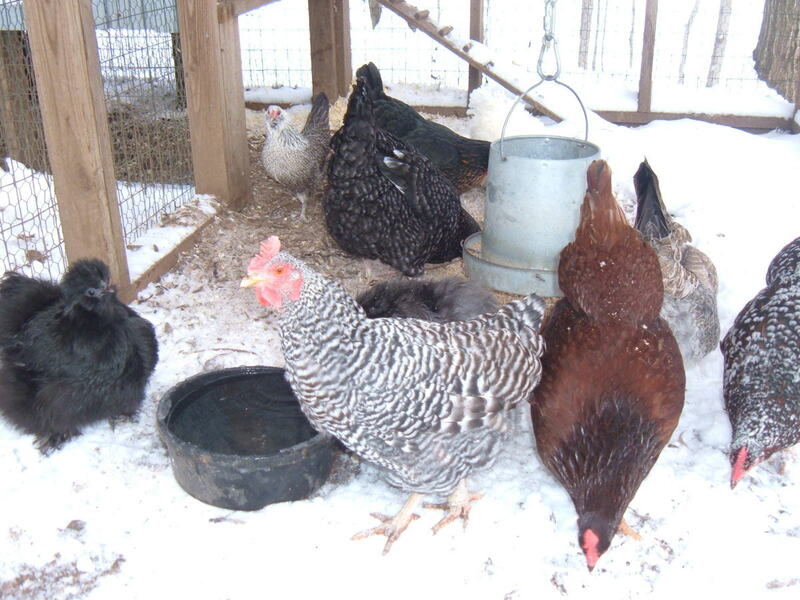 Great information about Caring for Chickens in Cold Weather. Do chickens get too hot in hot weather? I live in Vermont where temperatures can get down to 20 below or so each winter. I have a chicken house built around 1900. It is quite large, about the size of a car or small garage. It has windows facing south. It is made of wood and has a tight roof. Do you have any estimate as to how many chickens I would need to have to keep them warm enough through the winter?Great lens! Blessed by a Squid Angel! Great job! Can't wait till I can start a flock of my own.